Barcombe Romneys, Know Your Sheep, Romney wool, The Fibre Co.
With the arrival of Barcombe Romneys and Lore from The Fibre Co. at YAK we thought we’d find out a bit more about Romney sheep. Their history is a colourful one, including sheep smuggling, surviving the plague and being moved en masse during the Second World War. But today they are one of the best known sheep and their wool is enjoyed by knitters all over the world. Romneys originated on the Romney Marshes in Kent, England but they can now be found all over the world. In fact the vast majority of sheep industries have their origin in the Romney, making them one of the best know sheep in the world today. The history of Romney sheep on the Marsh can be traced back to as early as the 13th century, and despite the plague in 1346, where the Black Death had a devastating effect on sheep farming in Romney, the wool market survived and remained the most important part of trading at Romney Marsh for centuries to follow. By the 14th century, wool was England’s most important trading commodity. In 1660 a bill was passed preventing traders from exporting and Romney Marsh became the perfect place for sheep and wool smuggling due to its long sea coast facing France and this illegal trade escalated through the 18th and 19th centuries until the government made a concerted effort to put an end to it. In the 19th century the first shipment was sent to New Zealand where the Romneys quickly settled and remain the predominant breed in New Zealand today. In 1939 there were around 200,000 sheep on the Marsh, but during World War II, the sheep were sent away to hill farmers in Yorkshire so that the Marsh could be fortified to protect the coast from invasion. The fact that the sheep were evacuated before women and children speaks into the great value placed on the Romney. In the 20th century, Romneys were considered old fashioned as people favoured continental breeds, however in the 21st century they have re-established their place in sheep farming. Romneys are a hardy breed of sheep requiring low levels of attention especially when it comes to feeding and lambing. They are good forage converters and they are excellent mothers, lambing well on their own as well as being diligent in caring for their young. They are medium-sized sheep, with white faces, black noses and woolly legs. Interestingly, the conditions on Romney Marsh led to the development of specific characteristics such as tolerance to harsh, wet conditions, fleeces that withstand high rainfall and black hooves resistant to footrot. Romney fleeces have long been highly prized. Their fleece is heavy, semi lustrous and strong and they produce a high yield. The fibre has a well-defined crimp and the staples are long and usually oval or round as is typical with a stronger wool. The wool clip is sought for many commercial products. About 60% of the clip is strong, coarse wool and is used predominantly in the carpet industry. Whereas the finer fleece is easily spun, attractive to hand spinners and enjoyed by knitters. We are proud to now have two beautiful Romney yarns available at YAK. There is Barcombe Romneys DK, the stunning undyed yarn from sheep that live just down the road from us in Sussex (we got to meet them earlier in the month and you can read our interview with their Shepherdess Susanna Steer). 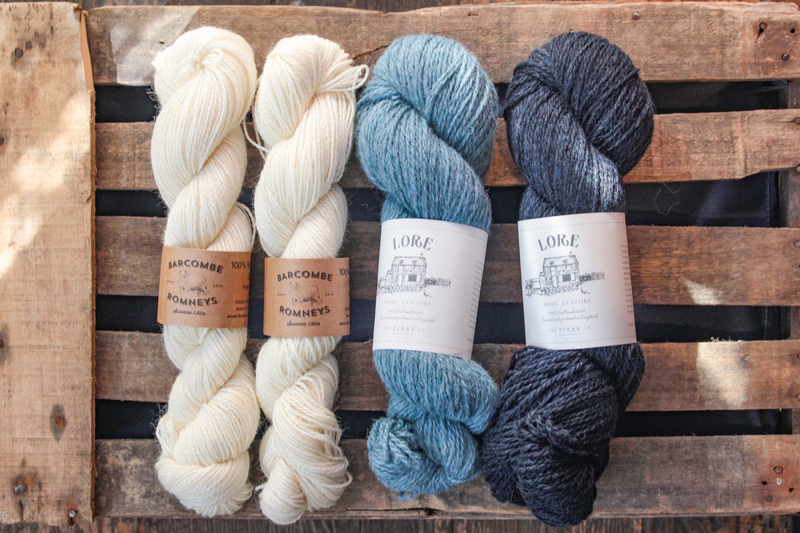 New to our shelves is Lore from The Fibre Co. Lore is 100% Romney lambswool and it comes in a beautiful colour palette. You can find both our Romney yarns here. Fournier, Nola and Fournier, Jane, In Sheep’s Clothing: A Handspinner’s Guide to Wool, Loveland: Interweave Press LLC, 1995. Print.